Wrecking Ball Human Demolition Inflatable for hire. 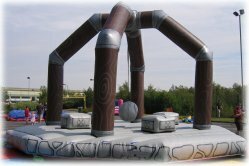 Our Human Demolition Inflatable is a high energy medieval themed game for four players at a time which can also be used for four way team competitions. Its suitable for both adults and children. Each of the four players stand on the inflatable podiums and hurl the demolition ball at each other trying knock their three opponents off their podiums. To win you'll need to be able to dodge the swinging demolition ball when its hurled at you or better still catch it and hurl it back where it came from! If being used for team events each team lines up behind a podium and as each team member is knocked off by the wrecking ball the next team member steps up to the podium to take their place until all team members are out and your left with the winning team. If you only have two teams each team has two podiums and those two podiums can play tactically to try and knock their opponents on the other two podiums off. Human Demolition is also ideal for fundays as it can accomodate four participants at a time enabling a higher turnover of customers and therefore a higher revenue. The Human Demolition needs an operating area of at least 32x32ft. It can be used indoors but due to its size you'll need a sports hall or similar with a 23ft height clearance. Any doors or gaps the equipment has to pass through need to be at least 33inches wide. This inflatable game is normally supplied with a supervisor to ensure its safe use. If you have any queries, questions, or would like to hire the Human Demolition Wrecking Ball Inflatable please call us on the number below or click to enquire and we will do all we can to help. If you're holding a medieval themed event why not also take a look at the Mobile Archery Sessions we offer?